Wrapping a Rogliano's marinated skewer of shrimp in Cedar...Fabulous! Peel the raw shrimp, leaving the tail on. Put in bowl, cover with Rogliano's Dressing, stir and refrigerate overnight. The next day assemble the skewers 5-6 shrimp per skewer. Use the rest of the marinade, brushing it on the shrimp. 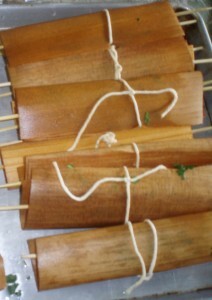 Wrap skewers in Cedar, tie with string. Cook on indirect medium high heat - 6-8 minutes.Peek in one end, when the shrimp changes color it's done.